For the last couple of years I have been dwelling on the subject of young children while writing Rest, Play, Grow. It has been an incredible journey that first began when my children were young and as I started working with Gordon Neufeld, studying and teaching his developmental and relational approach. As I endeavoured to make sense of what kids really needed from parents, I began to realize how confused we had become. I was personally frustrated with how experts contradicted each other. I was also dismayed to see how raising a child had been simplistically reduced into fragmented instructions, directions, or mantras to remember. At the same time I thought there was something wrong when parents felt they needed to get a degree in child psychology, neuroscience, and attachment science to raise a child. When I discovered Gordon Neufeld’s work I realized the key to parenting was insight and not skill. At the heart of becoming a parent are actually strong instincts and emotions and it is these that move us to make sense of our kids and what they need. Rest, Play, Grow was born from this place of tension inside of me. It was born from a desire to take a step back and make sense of how young children grow. As my book is released, I thought that the best way to mark it’s passage from my computer into the world, would be to share the three things that encapsulate what I really think young kids would like us to understand about them. Of course there are many more in the book, but Gordon has taught me that three points are best when walking around a phenomena. 1.We have become pushers instead of the gardeners young children really need. We have become consumed with how a young child acts and whether they are civilized that we have forgotten that they need patience, time, and care taking in order to grow. As Gordon states, an apple seed doesn’t look anything like the apple tree that bears fruit. We are in such a hurry and we think every moment should be a teachable one with a young child. This approach is exhausting for kids and for parents, detracting from all enjoyment in raising and enjoying them. The immature ways of young children are not personal – they are developmental. Young children lack impulse control because their brain is not fully developed. They are egocentric because in order to share yourself with another person you first have to have a self to share. They don’t use their words when emotionally charged because they are still trying to learn names for their feelings and lack self-control. They don’t always listen because they can only attend to one thing at a time and it isn’t always us. They need to be attached to us in order to want to follow us, but they also have instincts to resist us at the same time. This was not a mistake but part of a sophisticated developmental plan aimed at unfolding a mature human being. While we may be often confused by their behaviour, they are only being true to their instincts and emotions. When I step back to consider young children in all their baffling and immature ways along with how we treat them, I see clearly that we have lost our way somehow. We have become divided from our intuition that knows young children represent the most immature time of life. The first six years of life are remarkable but we haven’t really accepted how completely different they are from us in terms of functioning. We routinely look at their behaviour through our adult lens and miss the splendor and wonder they represent. They would really like us to stop holding their immaturity against them, give them some time to grow up, and to actively work at creating the conditions for them to thrive. Play is endangered for those who need it most. The second thing that struck me in doing the research on play and young children is how it has become endangered world-wide. To be honest, this was and still is, a heart breaking realization. The push towards early academics and structured activities is rampant and it is the clearest sign we are taking a wrong turn with our young children. What puzzles me is how we ignore decades of developmental science demonstrating how play is critical to healthy growth and functioning in young children. From brain development to the expression of emotions – play is where growth and development take a leap ahead. I am alarmed by the implications for young children in terms of their selfhood and emotional well-being. As I spent some time reflecting on why we ignore developmental research and our insight as to the importance of play, I believe it stems from parents worrying about their kid’s future. Parents are worried if they don’t push academics that their child will get left behind in a globally competitive, technologically driven, knowledge based society. The pervasive underlying belief is that ‘earlier is better,’ but this is incorrect from the perspective of developmental science. We can push a child to perform but this will come at a cost to vitality and selfhood, as well as stunt healthy development. More now than ever, I am resolved to staunchly defend and protect young children’s right and need to play. We think discipline is the answer to immature behaviour and it’s not. If we focused just half of our efforts away from how to discipline a young child and paid more attention to how we grow them up, we would finally have the answers we seek when it comes to their problematic behaviour. Discipline doesn’t make a child more mature, this is how we intervene to compensate for their immaturity. As a new parent I had so many questions about discipline but now I see this wasn’t the question I needed to be asking. We need to focus on how grow a child up so that discipline is no longer required. We need to raise a child who doesn’t just ‘act’ mature to garner favour but actually grow a child up so they will do the right thing when no one is looking. My goal as a parent is to raise my kids so that they will flourish as adaptive, social, and separate beings. There are no tricks, treats, or short cuts to get there except for providing for their relational and emotional needs. I want my kids to care about others, to consider more than just their needs, to care enough to strive for their goals, to have interests, desires, to be curious, to have tears in the face of adversity, and to have impulse control around their strong emotions. There is no discipline that will get me there. We treat their immaturity as a flaw and deficit to be corrected instead of seeing there is an organic solution to all of their behavioural issues. As a friend said to me, “but Deb, you are taking away my threats, bribes, rewards, punishments, and time outs – how am I supposed to parent?” I replied that it was sad day when being a parent was reduced to a tool belt of discipline skills. We are meant to be much more to our children. We are the ones to answer their hunger for contact and closeness, to nurture their hearts and ensure they care deeply. We are their place of shelter and the one responsible for ensuring they are receptive to our lessons as we guide them towards civilized relating and maturity. We cannot lead a child if we do not have their heart. Current approaches to discipline miss the mark on what is most important in raising a child and how it is about the realization of human potential. On a final note, I wanted to share that one of the sweetest discoveries in writing Rest, Play, Grow, was in reflecting on how incredibly fortunate I was to have found Gordon when my kids were young and to benefit from his counsel while doing a post-doctoral internship with him. Gordon Neufeld is a brilliant theorist, a gift to parents, and a true champion of all children. I am indebted to him for his generosity and support in making this book possible. What I am left with most of all after writing Rest, Play, Grow is how young children today need advocates. They need adults who want to preserve and protect the conditions that they will flourish in. What they would tell us if they could is that we need to give them the type of relationships that they can take for granted and can rest it, the space and freedom to play, and for us to stop obsessing about their growth and to sit back and watch the splendor of human development reveal itself. My sincere hope is that you are one of these adults and that you will join me in this endeavour. Deborah is on faculty at the Neufeld Institute and in private practice working with parent of children and teens. 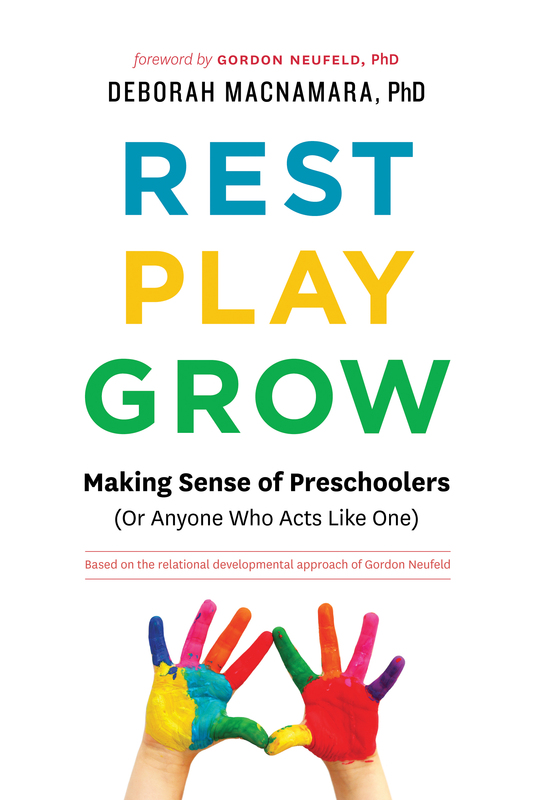 She is the author of Rest, Play, Grow: Making Sense of Preschoolers (or anyone who acts like one). All work is based on the relational and developmental approach of Gordon Neufeld, PhD, please see www.macnamara.ca for more information or www.neufeldinstitute.org.